Jan. 18, 1935 - Sept. 15, 2017 OKLAHOMA CITY Martha C. King, age 82, died peacefully at home Sept. 15, 2017. She was preceded in death by her parents, Thomas & Clementine Sumonka; and sister, Marie Reinkemeyer. 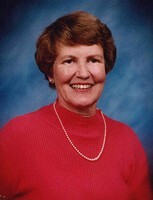 She is survived by her husband, William R. King, whom she married in 1972, and by her loving nieces and nephews. As a member of the Benedictine religious order, she was known as Sister Pauline, teaching high school English at Monte Cassino, Tulsa, and at Bishop McGuinness, Oklahoma City. In 1969, Martha founded Neighbor for Neighbor in Oklahoma City, a local charity that assisted low-income families and individuals with basic needs. In 1985, she joined World Neighbors, an international charity, as the director of nationwide volunteers and tour leader for visits to World Neighbor projects. After her 1992 retirement, Martha volunteered for local groups, including Oklahoma City Community Foundation and Infant Crisis Services. She and Bill also hosted many overseas medical doctors who did research at OU. For her lifetime of service to the poor and vulnerable, Martha received numerous community awards. The family thanks Martha's caregivers and Good Journey Hospice for their devoted care. A Memorial Service will be held at Smith & Kernke, 14624 N. May Ave., on Thursday, Oct. 5 at 4 p.m. Memorials may be made to Martha's scholarship fund at OCCF or to Infant Crisis Services.